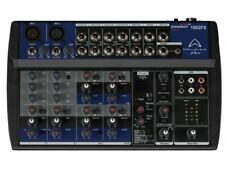 Behringer ZMX8210 Ultrazone 8-Channel 3-Bus Mic/Line Zone 19 1U Rack Mixer. Looks like it’s never been used - Mint condition. Fully boxed with manual, cable and microphone. ADD MUSIC AND NARRATION TO YOUR VIDEOS. FULL WORKING ORDER. You can of course add your own mains power but it should run fine off a battery. MACKIE Mix12FX. Great for straightforward applications that need a professional touch, the Mix12FX features a selection of 12 integrated effects like reverbs and delays. Plus, wouldn’t you rather mix on a Mackie?. 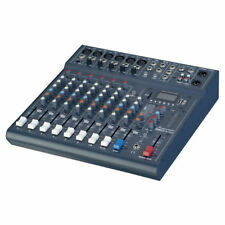 Behringer Xenyx X1204 USB Mixer Live Studio Mixing Desk inc Warranty. Amplifiers & Mixer. Mixer Cases. To add further practicality to the unit, there is a built in MP3 player and Bluetooth playback facility to give you every opportunity to make your live performance as quick and easy to set-up as possible. PULSE PMH200 MIXER AMPLIFIER. Power output - 2x 75W RMS (2x 100W peak). 2 Band EQ on each input channel. 3 Band EQ on main output. 2x Locking speaker output sockets. Record output. 4x 6.35mm (1/4") jack line level inputs. The Hill Audio RPX-2300 is a stereo 2-way/mono 3-way active crossover, designed for better sound and protection by multi-amping a sound system. For further protection, 25 Hz Low Cut filters are provided to eliminate inaudible high-energy bass content. Weight: 1.7kg. Input:Mic: /- 1.5mV. Output level: /- 1V. Signal to noise ratio: >110dB. Presets: 16. THD: <0.01%. Frequency response: 15Hz - 40kHz. BT-receiver for audio streaming. Amplifiers & Mixer. Mixer Cases. Five of these channels are microphone inputs with XLR/1/4” combo sockets, the other two channels are RCA line level stereo inputs.Adding to the features the ZM 107 has a 3 band EQ, mono output, echo and a front panel mounted AUX input ideal for MP3 players. Amplifiers & Mixer. Mixer Cases. Special Effects. Bubble Machines. 1x built-in effect with delay & repeat function. Other Stands. Microphone Stands. Lighting Stands. How do I find the item number or product code?. Active PA Speakers. Product Code: SSC0021. Need more information?. What if I have not received my order?. When will I receive confirmation of my order?. The C3X model also includes the Studiomaster custom DSP effects processor. A smaller unit that still has all the professional features you need for quality sound. For added flexibility two inputs are on the front and two on the rear panel. 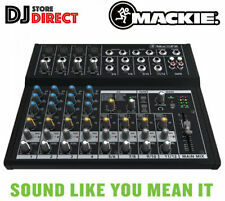 Mackie Mix Series Mix8 8-Channel Compact Professional Studio Live Mixer. This mixer is good as new with manual. 100 Alesis DSP effects. 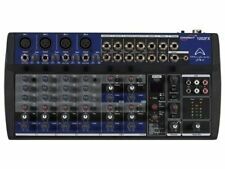 MixerProfessional 16 Channel / 4-Bus Mixer. Dynamic compression (channels 1-6). 19" Rack CompatibleNo. 3-band EQ with sweepable mids. 60mm Faders with mute and PFL/AFL solo functions. Smoke Machines. Can I reserve item(s) that I intend to buy later?. All Other Outputs: 120 Ohms. Garden & Patio. What is the warranty period on Electromarket products?. When will I receive confirmation of my order?. 8-channel audio mixer,with 12 input, DSP effect unit and USB interface. Plug and mix! DSP with 100 different effects. Equalizer bass : ± 15 dB / 80 Hz. Equalizer treble : ± 15 dB / 12 kHz. Equalizer midrange : ± 15 dB / 2.5 kHz. The Wharfedale SL 824 mixer is a studio/live mixing console with built-in full duplex USB interfacing. Amplifiers & Mixer. Mixer Cases. Wireless Microphones. PA Systems. Phantom Power Yes. EQ 3 Band with HPF. Four of these channels are mono mic/line inputs via XLR sockets, the other four channels are RCA line level stereo inputs. Adding to the featuresthe ZM 84 has a 2 band EQ for each channel, two master outputs and a front panel mounted AUX input ideal for MP3 players. The Alto Professional Live 802 is a pro 8-channel, 2-bus mixer equipped with the tools you need to create the perfect mix. With its diverse connectivity options, Live 802 is ready for any event. 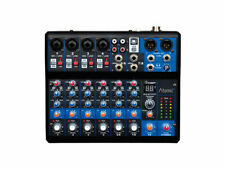 Alto Live 802 Mixer. The Hill Audio RPX-3400 is a stereo 2/3-way | mono 4-way active crossover, designed for better sound and protection by multi-amping a sound system. Mute and Phase Invert switches for all outputs make troubleshooting a breeze. Preset effects: 100. - Channels: 10. The Alto Professional Live 2404 is a pro 24-channel, 4-bus mixer equipped with the tools you need to create the perfect mix. Each microphone channel is outfitted with a high-headroom ultra-low-noise DNA™ microphone preamp for unprecedented sound quality and a robust audio signal path. Amplifiers & Mixer. The Alto Professional Live 1202 is a pro 12-channel, 2-bus mixer equipped with the tools you need to create the perfect mix. Mixer Cases. Wireless Microphones. Dynamic compression (Channels 1-4). Effect devices / signal processor. Pipe clamp & hook. Channel EQ Mic input: XLR, balanced. Input sensitivity:-35dBu ~ 15dBu. Line input: 6.35 mm TRS/RCA unbalanced. Input sensitivity:-20dBu ~ 20dBu. This 4-channel mixer with amplifier suits a number of different applications, like Live PA, DJ, musicians, bands and other PA purposes. Each input channel has separate bass and treble control as well as an individual level control per channel. The built-in echo effect generator has adjustable time and repeat options and the level can be set for each channel individually. The unit is built in a strong and sturdy case that will protect the mixer both on-stage and during transport. Amplifiers & Mixer. Mixer Cases. Adding to the features, the ZM 122 has a 3 band EQ, mono out and microphone out all in a 1U 19” rack mount unit. Six mono channels with combo XLR/Jack input, each with Mic/Mic Phantom/Line selector. Review Behringer Q1202USB. Maximum Input Level 12 dBu @ 10 dB Gain. Maximum Input Level 22 dBu @ 0 dB gain. Gain Range 10 to 60 dB. Signal-to-Noise Ratio 110 dB A-weighted (0 dBu In @ 22 dB gain). Hifi Separates. Versatile Inputs and Outputs. Professional Mixing Features. Product Code: SSD0441. Smoke Machines. Can I reserve item(s) that I intend to buy later?. Garden & Patio. What is the warranty period on Electromarket products?. Amplifiers & Mixer. Channel 1 is dedicated to the ZM 102 microphone and has priority over all inputs. Mixer Cases. LED signalindicators for inputs 1-10. Two balanced XLR line outputs, one per output zone. The W Audio DMIX 10 FX mixing desk features 2 microphone and 4 stereo inputs in a compact size and very affordable mixing desk with 100 preset effects. 10 Channel mixing desk. Stand Accessories. 3-band EQ on each channel. Amplifiers & Mixer. Mixer Cases. The auto-talkover feature of the microphone section allows automatic attenuation of the music signal by an adjustable amount when speaking into a microphone. Built-in Bluetooth module. When will I receive confirmation of my order?. Garden & Patio. Multiple Input Connection. On-Board Echo Effect Generator. XLR, Jack and RCA Connections. Key Features. Accessories for Trussing. Can I reserve item(s) that I intend to buy later?. The Wharfedale Pro Connect 1202FX/USB is a compact mixing desk with massive capabilities. 16 Total inputs (4 x XLR / 6.3mm Jack, 4x twin 6.3mm jack). 16 bit / 48kHz built in USB audio interface. Playback and record via USB audio interface. 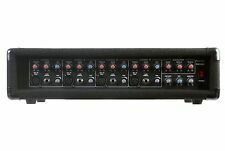 The Mackie ProFX4v2 4-channel effects mixer provides a comprehensive live sound solution for singer/songwriters and other low channel count applications. A no-compromise live sound toolkit includes a room-shaping GEQ and flexible I/O for professional applications. Preset effects: 100. Channels: 12. Weight: 3.6kg. 115V range /-10% ~ 50/60Hz 104mA max. Power Consumption: 230V /-10% ~ 50/60Hz 52mA max. Keyboard Amplifiers. Output Levels. Dynamic Range: >15dBu. Residual: -93dBu. Frequency Response (any input): 22Hz-40kHz ( /-0.5dB).